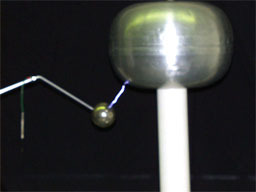 The Van de Graaff separates the two kinds of charges from each other. A conveyor belt picks up charges from the base and puts them on the big dome. 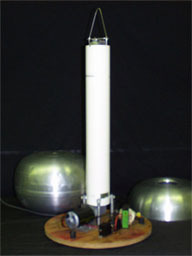 One kind of charge (positive) is on the large collector, and the other (negative) is on the grounding ball. The opposite charges want to get together so much that they will even jump through the air to do it. If someone is touching the dome, the charge collects on them too. The charge spreads out all over them, including onto their hair. Since each hair is covered with the same kind of charge, each hair wants to get away from the others. The sparks from the Van de Graaff are not dangerous, but they are startling and they sometimes hurt. Ground the machine (touch a ground wire or the grounding ball to the dome) right after each use. If you don't do it right away, you'll forget. 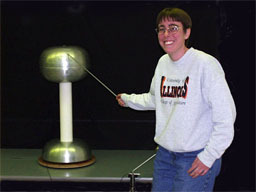 If you allow children to use the Van de Graaff generator, you MUST get a parent or guardian's permission. The VDGG is harmless to most people, but could possibly cause problems to someone with a heart condition or pacemaker. This demo comes right after Charges. 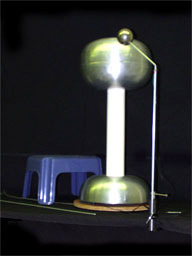 Explain how the Van de Graaff generator works. It's important for the kids to know that the machines we use aren't complicated or mysterious. Emphasize that the two types of charge are separated onto the two balls. If you can, have someone turn off the lights while you are using the VDGG. That makes it easier for the kids to see the sparks. Make sure that the whole audience gets to see the sparks (i.e. move around). You might want to mention that this is the same way lightning works. Air molecules and water drops can collect charge by bumping into each other. When enough charges are built up in the air, charges jump through the air to reach each other. Get a van volunteer to stand on the rubbermaid stool and point the charging rod at the dome (or touch it). Explain that they get covered with the same kind of charge that is on the dome. AFTER THE VDGG IS TURNED OFF, the person can discharge safely by touching the charging rod to the metal base. Discharge the dome immediately after using the VDGG.